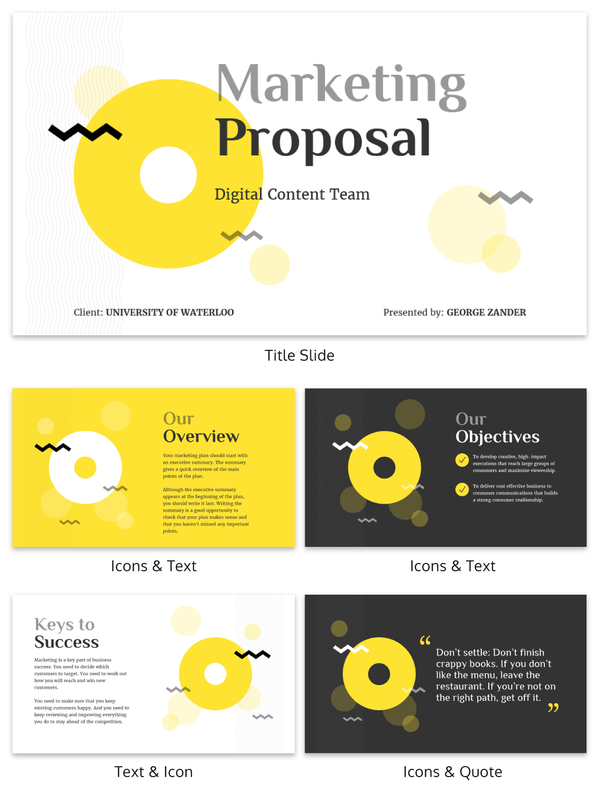 Make your proposal visually captivating by getting started with this marketing proposal business presentation template! When you need to pitch a marketing proposal, you can’t go wrong with this Zig Zag Marketing Proposal Business Presentation! It’s the easiest template to edit and simple in design to grab the attention of your audience. You can completely customize the Zig Zag Marketing Proposal Business Presentation template whether you just edit the text or you change the design and layout. Edit the color scheme, images, font, and icons to build the template around your business brand. Make the Zig Zag Marketing Proposal Business Presentation as simple or as detailed as you want. Add tables and charts or upload photos for a more personalized look.